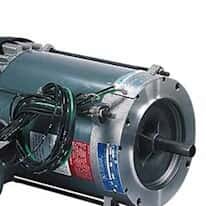 Select from faced motors, DC motors, and AC motors. Faced motors are one of the most common motors used in installations. We have a wide selection of faced motors, including an extensive selection of standard NEMA frame motors. IEC configurations are also available. DC motors are used for a variety of variable-speed applications. Air motors are inherently intrinsically safe due to lack of electrical power. They are not as efficient as electric motors. AC motors are available in single- and three-phased power.